Enjoy outdoor dining and casual elegance with our fine teak garden tables. From our enormous extending table that seats 14 to a cosy cafe table for two, our teak tables are available in a large assortment of sizes and shapes. Ideal for the garden, patio or deck, these tables will quickly become your favourite place to rest and relax. Indulge in the ease and comfort of an integrated Lazy Susan with the Turnworth Ring Table. Crafted and designed by our design team, the flush mount design makes it easy to pass dishes around without reducing visibility. In other words, enjoy watching the faces of friends across the table on sultry summer evenings or crisp, fall mornings. Perfect for family dining or early morning coffee breaks. Picnics, tea parties, or happy hour with good friends, our tables add classic elegance and unrivalled style to your yard. Our elegant teak tables are constructed of the finest sustainable teak. Available in four major types - extending, fixed legged tables, rectangular, folding round tables, and coffee and side tables, our garden tables are classic in design with clean architectural lines and timeless style. The well-made construction ensures enjoyment for years to come, making our tables a sound investment. 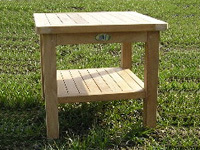 If you're looking for fine garden furniture, look no further than natural teak furniture. Order today and enjoy a lifetime of outdoor memories.